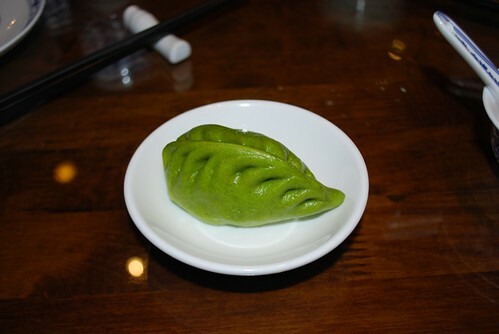 My New Favorite Jiaozi Dian! The countdown is on! We only have a little over 6 months left living in Chengdu. The one things that I will miss most (besides my incredible friends) is the food. For my New Year's resolution I promised myself I would eat more Sichuan food, take pictures and write about it. We spent the Christmas and New Year holiday in Thailand, which is our favorite spot to vacation. Sun, sand, sea, and food is always the perfect combination for rest and relaxation. 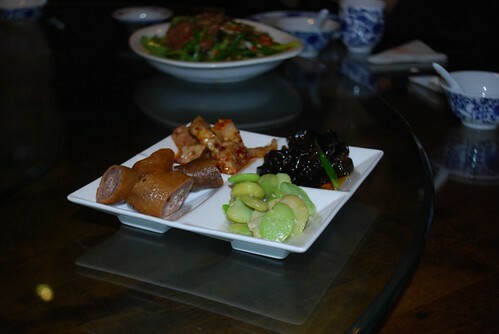 The one thing our family missed the most while we were away was our Sichuan food. We were back in the early afternoon, so we headed to our favorite homestyle Sichuan restaurant for some spice and something to warm our cold bodies from the shockingly cold weather we arrived to. 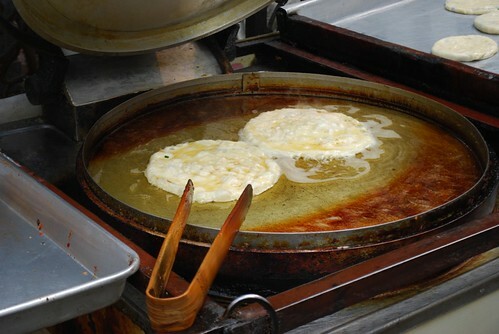 Heaven on a plate! My friend Laura said she would be happy if she died eating a plate of these crunchy potatoes! 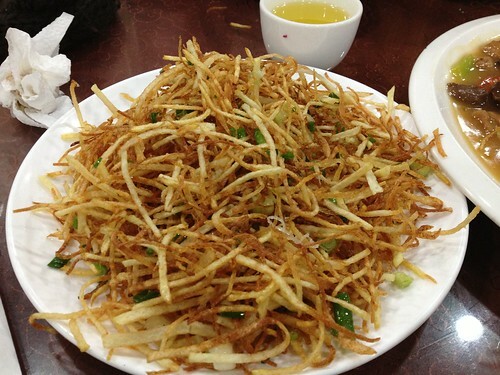 Gan Bian Tu Dou Si or Shoestring dry fried potatoes. 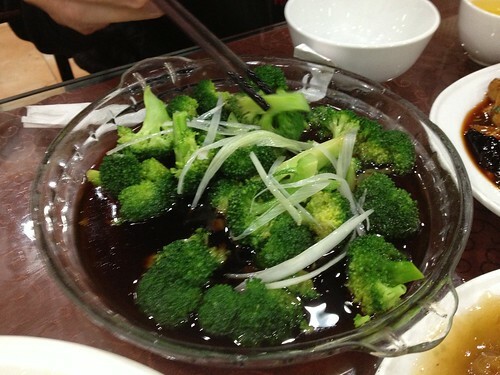 Fried broccoli in a lovely soy and scallion sauce. 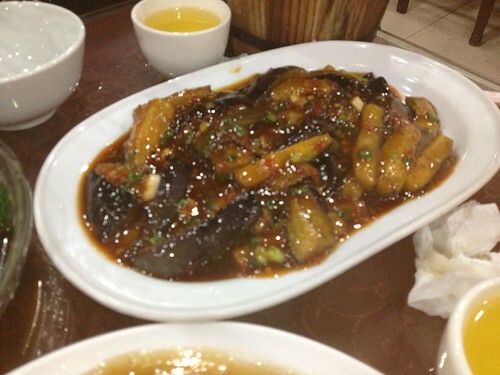 My favorite dish of any Sichuan food, Yu Xiang Qiezi or Fish Fragrant Eggplant. 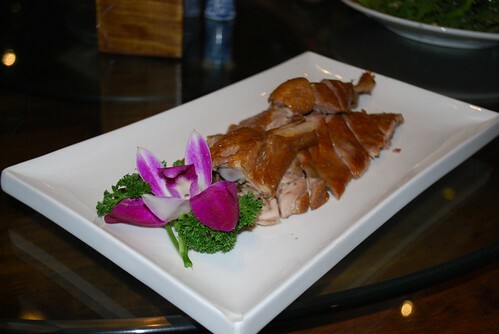 Guo Ba Rou Pian or Pork in Lychee sauce. Dried and fried rice cakes with a blend of lean pork, tomatoes, wood ear mushrooms, fresh bamboo, and our favorite Chinese vegetable wo sun. Lightly sweet and sour. In my promise to myself I said I will eat more Sichuan lunches at little hole in the wall joints. In search of a new jiaozi dian (dumpling shop) my driver took me to one of his favorite little lunch spots, Pin Ke Lai, close to our house. 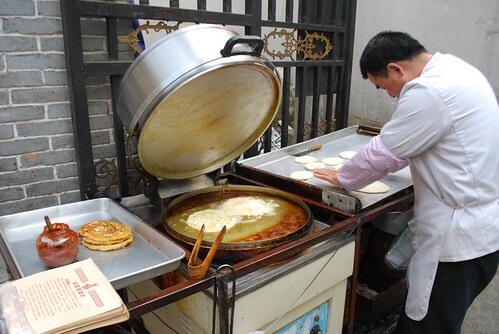 They are known for the baozi, but they also have jiaozi, noodles, and eggs. It has replaced my little shop across the street from our house as my new favorite, go-to quick lunch spot. I had been craving their jiaozi in their beautiful red chili sauce since we left 3 weeks ago. 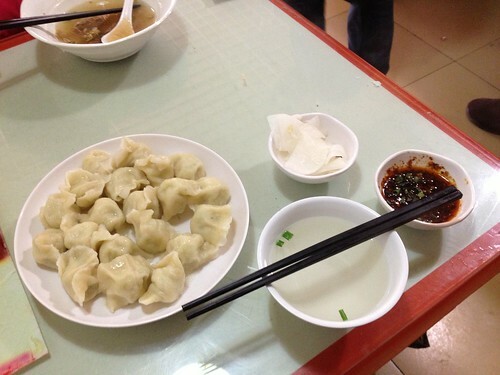 An order of about 20 jiaozi will set you back 8 yuan or $1.29. 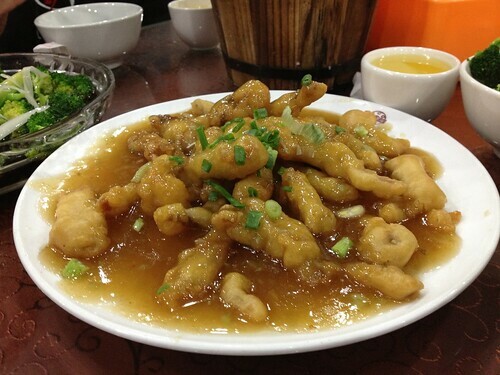 I prefer the pork and cabbage to the pork and jiu cai (Chinese chive). 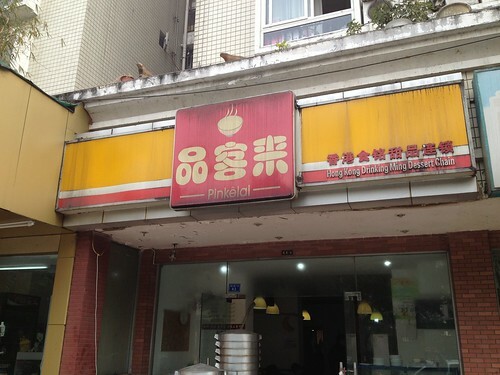 It is also served with the chili sauce, steaming hot broth, and the most delicious pao cai or pickled radishes A half an order will only set you back 5 yuan, but as you can see I need the full order to fill me up! 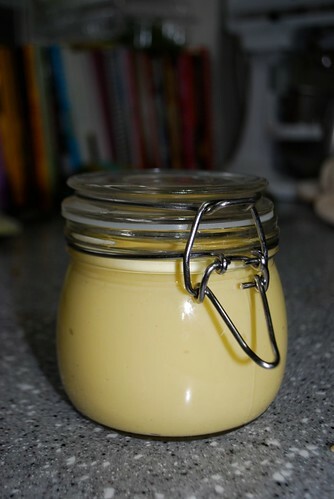 Today I tried a new recipe for for mayonnaise from my Avoca Salad cookbook. 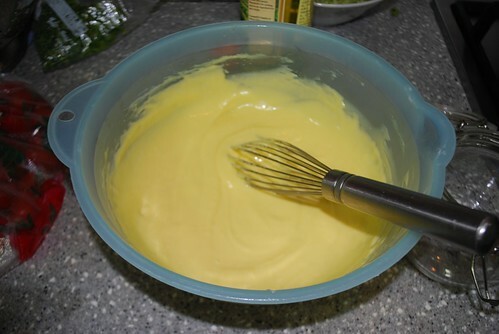 I had very little hope as I have tried so many times to make mayonnaise and it always turned out without luster. I have tried whole egg mayo, but it was just usable. Most of the time I couldn't get it to emulsify. Tonight though, success!!! The mayonnaise jarred and ready to go! Now to decide what delicious delicacy I can whip up using this gorgeous sauce. I may just have it on a slice of toast for breakfast! I have lived in China for over 6 1/2 years and it took me that long to get the nerve up to have a cupping treatment or ba huo guan 跋火罐. Part of the reason that I did not think about doing this is because of the bruising it leaves on your back. The cupping causes blood vessels to expand at the surface of your skin and these are your results. I have to say that I have never taken a photo of my back nor do I ever try and look at my back. I didn't realize that I had so many moles! I was also told by my friend that my bruising was not very bad which means I am very healthy. I hope this is true! They also did cupping on my feet and my skins, but no marks were left there. I definitely enjoyed this experience and will try it again. Next time I will wait to do it when I have a cold or sinus infection to see if it helps my healing process. We had another quiet week-end this past week-end. Friday night I made a Mexican food extravaganza and we had a few friends over to share the food. 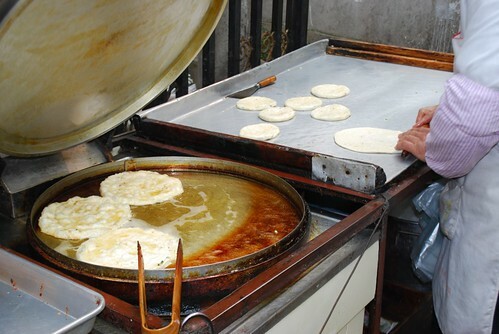 I always like making Mexican food for people who have never lived close to Mexico, they are always surprised by what great flavor it has and even though I am not proficient in this genre they always love my food. Saturday Angus and Gemma had a birthday party in the morning and Jonny and I had a sleepover planned at the Sofitel. One of the benefits to living overseas is that we have help with the kids. Our ayi agreed to stay over night and watch the kids while we had a relaxing night, kid free. 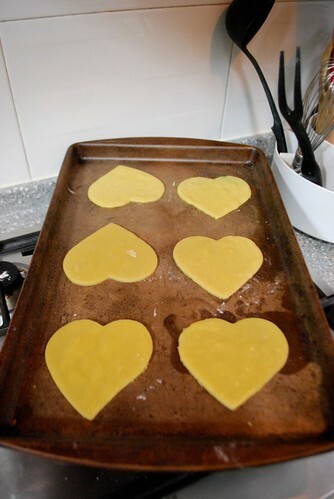 I promised the kids when we returned refreshed and recharged that we would make our Valentine's Day heart cut-out cookies that we try and make every year. 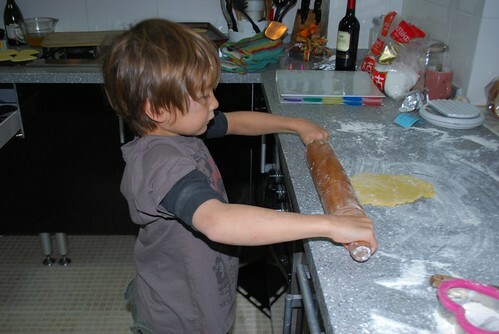 Angus rolling out the dough. We ended up with about 50 cookies and I sent them to school with the kids to share with their classmates. 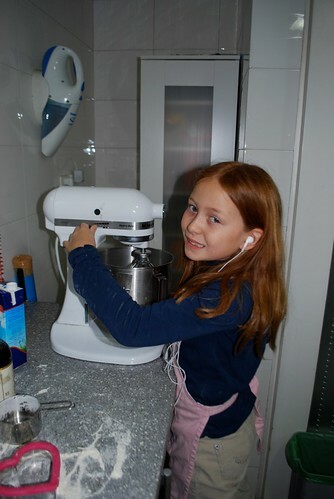 Our baking experience was a little stressful at first, but when we got to the frosting and decorating part it became much easier. 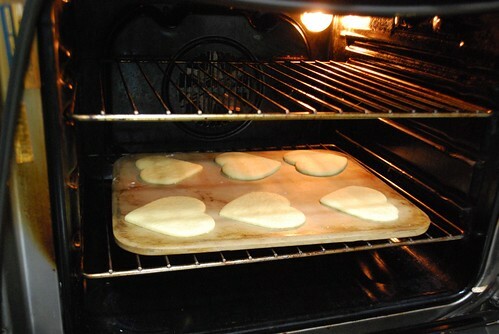 I do have to say however, I think I am in desperate need to overhaul my sugar cookie recipe. The flavor of these cookies are getting a bit boring for me. I think I will have to scan the internet or better yet Pinterest to see what I come up with! One of the things that I have wanted to do this year was to try and eat at as many new Sichuan restaurants I can before the inevitable happens and I land myself back stateside. Thanks to a little motivation by Fuchsia Dunlop's recent visit and article I had just the motivation that I needed to hit the food trail. I was able to round up 8 of my most adventurous eating friends and hit our first restaurant. 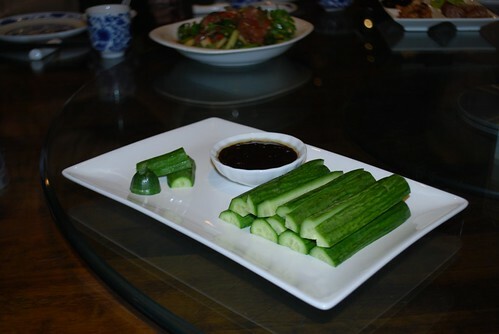 I chose Shun Xing Teahouse 顺星茶楼 as our first restaurant because I didn't want to scare anyone off on our first week. 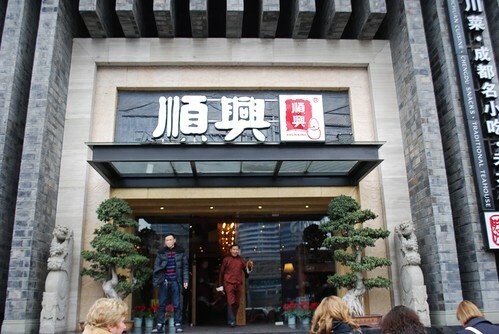 There als happened to be some extremely cold weather hitting Chengdu and wanted a place that we could all eat in comfort without worrying about freezing. I was pleasantly surprised when we arrived and a couple of the women said they had been to this restaurant before and it was extremely good. This was my absolute favorite! 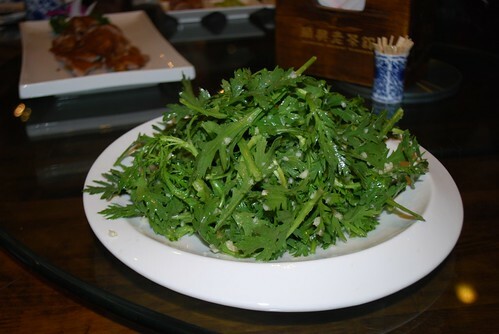 It is this green, leafy vegetable Tong Hao Cai 桐耗菜 that looks similar to rocket/arugula. They served it in a lovely, sweet, vinegar dressing. 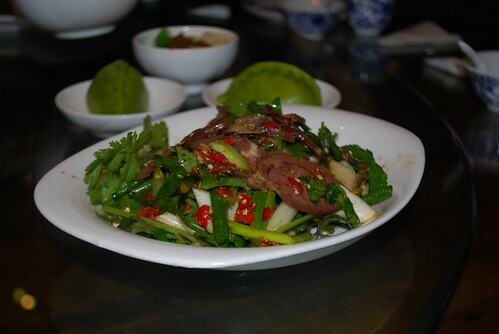 This was a beef cold dish with garlic shoots, cilantro and red chilies. It had a nice sweet dressing to cool it down. The restaurant was absolutely beautiful with a small photo museum in the back of the restaurant with old photos of Chengdu. In the evening they also have a Changing Mask performance, but reservations are a must as they are always fully booked. The other thing that I loved about the restaurant is they had men coming around to your table asking if they can clean your ear or give you a massage. I look forward to returning to Shun Xing Teahouse in the very near future with my family and visitor.